Just when you thought it was safe to go outside again, Mother Nature had other things in store. As hard as this is to believe, farming in 2011 made the 2010 vintage feel like a walk in the park. Not only did we have to deal with angry birds again, but we somehow had to ripen a crop without the benefit of summer. 2011 turned out to be the coldest year on record here in Oregon. Bloom, something we can usually count on in early June, was not complete until the first week of July. I was heard to say on several occasions, to anyone who would listen, that 2011 would not be providing us a crop. Thankfully, I was wrong. One positive thing I can say about the weather in 2011 was that October, while cool, stayed relatively dry which allowed our grapes to remain on the vine much longer than usual. Harvest started on the 26th of October and finished up just before Halloween. Consequently, by the time we picked, seeds had turned brown and there was consistent lignification (darkening of stems) throughout the vineyard. So, I did something a little crazy and decided to devote several fermenters to whole cluster fermentations. And, six months later when tasting thought the vintage, two 100% whole cluster barrels just screamed to be separated from the pack. Bottled 14 months after living in barrel, the wine was shipped off the Abbey and left to age for 4 years. In 2015, we finally got a label on them and voila. When first put in bottle, this wine was quite lean and tasted a little too much like dirt. Five years later, it’s a far different story. The initial impression of this Pinot Noir is delicate and classy with a beautiful perfume of bright red raspberries, rose pedal, cedar and white pepper. Across the pallet, the wine shows the strong backbone of tannins to be expected from the whole cluster process. The delicate aromatics yield to tangy rhubarb, red current, box spice, with just a hint forest floor and earth . While food could certainly accompany this bundle of elegance and strength, we recommend enjoying and contemplating this wine as a central focus of pleasure. 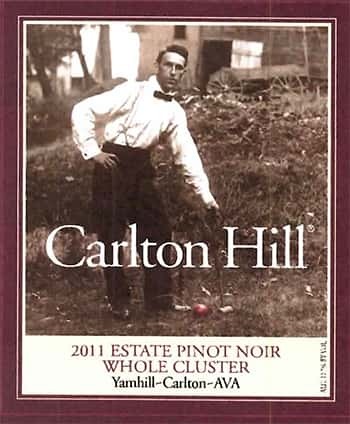 Admittedly, the decision to bottle a 100% whole cluster Pinot Noir in a year like 2011 was risky. We believe now our little experiment was a success and are considering resubmitting this wine to Wine Advocate now that it has enjoyed five years in the bottle. What a difference time makes. Enjoy!